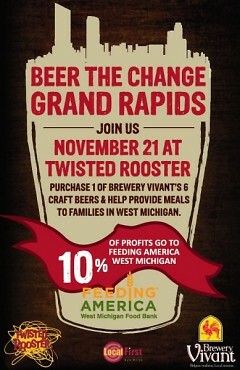 Twisted Rooster features seven Vivant ales, including a new seasonal heavy-hitter, to benefit Feeding America West Michigan. “Food insecurity” refers to a person's inability at some point in the year to access enough food to live a healthy, active life. 1 in 7 people in West Michigan and the Upper Peninsula are food insecure. Among children, that figure is 1 in 5. Every year, approximately 40 percent of the food produced in the United States goes to waste. Food banks like Feeding America West Michigan work with local farmers, grocery stores, food processors, and food transportation companies to prevent surplus food from going to waste. 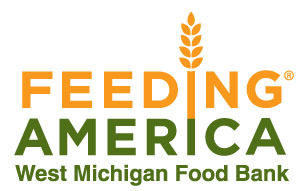 Feeding America West Michigan distributes that food to more than 1,200 food pantries, soup kitchens and homeless shelters from Benton Harbor through the Upper Peninsula. Kent County may lose more than $11 million in federal hunger-relief benefits over the next year, according to Feeding America's national office. On Thursday, Nov. 21, Grand Rapids’ Twisted Rooster will make room on its draft list for half a dozen beers from Brewery Vivant. The event is expected to pique the interest of local beer geeks with this season’s restaurant debut of PlowHorse, a 9 percent-ABV imperial stout with enough muscle to banish the mid-November chill. 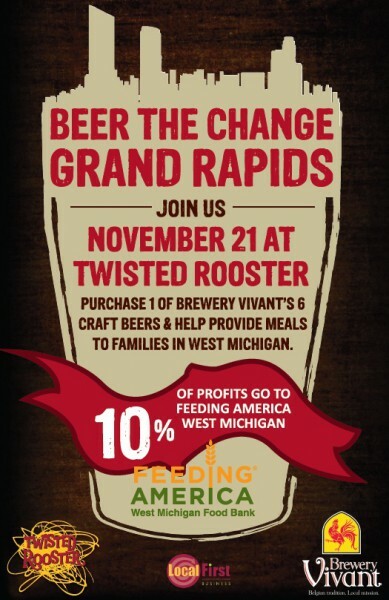 Twisted Rooster and Brewery Vivant will donate 10 percent of food and drink sales from 3 p.m. to close to Feeding America West Michigan Food Bank, a hunger-relief organization based in Comstock Park. Back in April, Crooked Goose, Twisted Rooster’s sister restaurant in Standale, hosted a similar Brewery Vivant takeover, raising enough to distribute more than 2,700 meals to food-insecure Michiganders. For Spaulding, supporting Feeding America West Michigan is a way to serve those members of the community who couldn’t afford a meal at her brewery. But, as both Brewery Vivant and Twisted Rooster source ingredients from many of the local growers and suppliers who donate product to the Food Bank, it’s also a reflection of their shared stake in West Michigan’s food system. “We’re at a different part in that closed circle. If we’re supporting these farmers that are also giving to you, that’s pretty awesome,” Spaulding said. “It’s very symbiotic,” said the Food Bank’s Andrew Steiner. “We all rely on each other to feed people whether by traditional means or through our charity network. Thanks to the generosity of local donors, Feeding America West Michigan is on track to distribute more than 25 million pounds of food this year, a record for the organization. Along with PlowHorse, the tap takeover will feature a mix of flagship and specialty beers: Farmhand, a French-style farmhouse ale, Triomphe, a Belgian-style India pale ale, Big Red Coq, a red ale made with Citra hops, Zaison, an imperial saison brewed with Tellicherry black peppercorns, Trebuchet, a double India pale ale, Sgt. Peppercorn, a rye pale ale, and the Tripel, whose name really says it all. Twisted Rooster is located at 1600 East Beltline Avenue NE in Grand Rapids.